The Economics of Fracking: Is Fracking Worth the Health and Environmental Risks? Note: This article is part 1 of a two-part series on fracking. 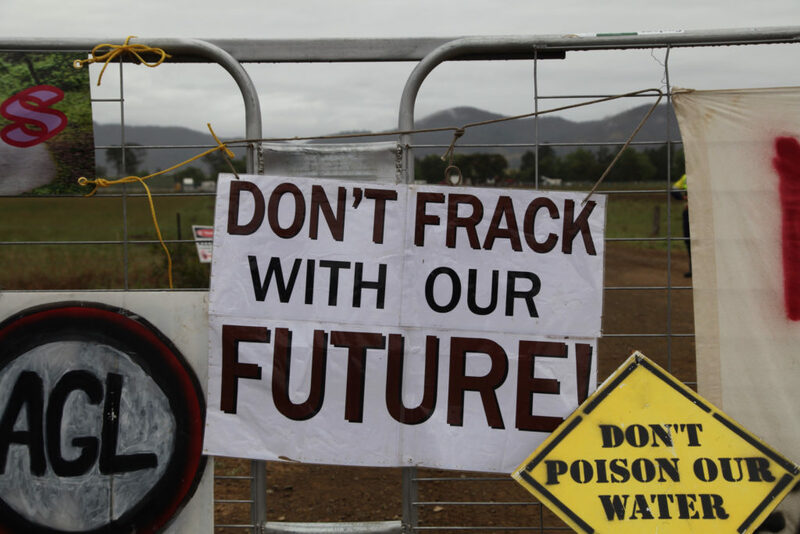 You can read part 1, The Environmental Concerns of Fracking, here. Since 1947, hydraulic fracturing, also known as fracking, has been used at natural gas wells to increase oil and gas production. Fracking operations have increased drastically in recent years as new drilling techniques provide access to oil and gas deposits previously thought unreachable. 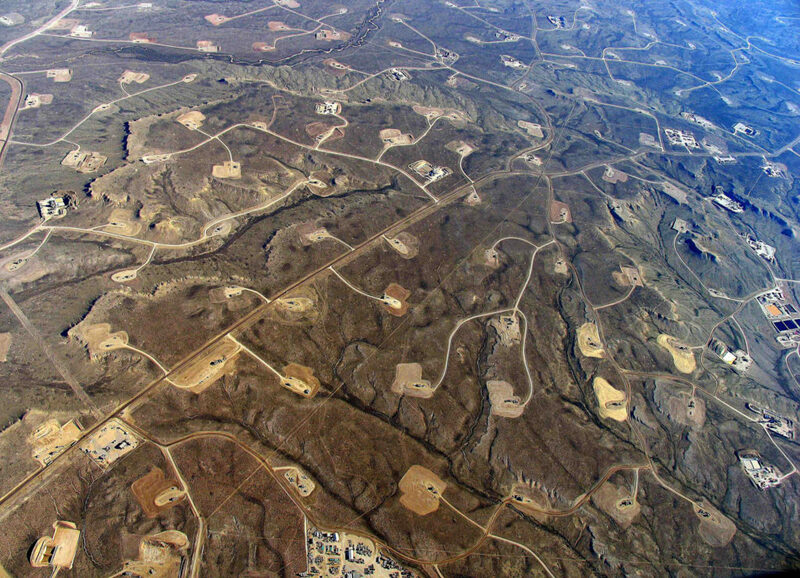 Fracking landscape. Image credits: Simon Fraser University. Hydraulic fracturing comes into play after workers drill a well. Casing and cement are put in place during the drilling process to create a barrier between groundwater and inside the well. This barrier prevents contamination and aids the flowback of fluids from well treatments. Once the barrier is in place and the drill rig has been moved off the pad, the fracking crew set up their equipment at the well site. A fracking crew uses eight to 16 pump trucks to pump fracturing fluid — a mixture of water, sand and chemicals — into the well. A pump truck with an industrial diesel engine, transmission and pump that is capable of producing thousands of horsepower pump the fracking fluid under great pressure to create fissures in the rock. Those fissures are propped open with sand to allow oil or gas to flow freely to the surface. The effort to fracture a well requires lots of personnel as well as support services. For example, a fracking site requires services such as such as catering, water transfer, outhouses and mobile lighting systems. There are economic benefits to fracking. According to the publication Energy from Shale, for example, the oil and gas industry supported 2.1 million jobs in 2012 and could support 3.9 million jobs by 2025. In addition, fracking has decreased our dependence on other forms of energy. During the past 60 years, more than 1.1 million fracturing operations have helped deliver more than 600 trillion cubic feet of natural gas. The American Petroleum Institute estimates the energy surge made possible by fracking led to a household savings of $1,200 in 2012. 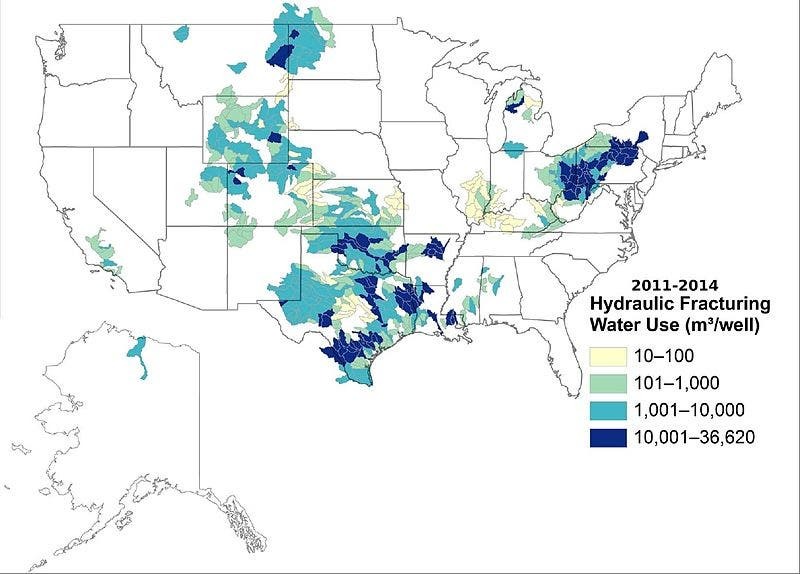 Hydraulic fracking is also notorious for the immense quantities of water it requires. Workers’ safety on fracking sites is a major concern. For example, silica dust from sand used in the fracturing process can cause serious lung damage (silicosis). Although the Occupational Health and Safety Administration (OHSA) regulates sand dust, OSHA has no onsite enforcement role. OSHA has released a hazard alert to notify employees that “respirable crystalline silica” can lead to silicosis, “a lung disease where lung tissue around trapped silica particles reacts, causing inflammation and scarring and reduced ability to take in oxygen.” OSHA says studies show that 47% of air samples from well sites are greater than the calculated OSHA permissible exposure limit. Some chemicals used in the fracking process are also known to be toxic and carcinogenic. The public is directly affected by hydraulic fracturing operations, even if there were no environmental pollutants. For example, many roads are not designed to carry thousands of tractor-trailers that carry the enormous amount of fracking equipment. Each tractor-trailer weighs more than 100,000 pounds and they quickly damage these roads, which then must be repaired using local and state funds. In small towns, for instance, roads are not designed to support these tractor-trailers. A typical country road will last approximately 20 years. It is estimated that it takes approximately 1,760 to 1,904 truck trips hauling equipment, materials and water to build, drill and frack a single well. The New York State Department of Transportation estimates the cost to repair roads due to oil field activity is roughly $378 million. Finally, there is the problem of methane gas emissions. The oil and gas industry is responsible for 30% of methane emissions in the United States. Older pipelines leak and outdated technology vents the gas into the atmosphere. Injection wells have recently become a hot topic among environmentalists because these wells are used to dispose of wastewater that comes from the oil and gas drilling. The concern is that the wells might cause more seismic activities and earthquakes that can lead to groundwater contamination. Many of the processes used in hydraulic fracturing are dangerous and can lead to health, safety, and environmental problems. The oil and gas service providers must act responsibly when producing oil. Although most companies act responsibly, other companies may only be interested in their short-term gains. Therefore, it is important for the federal government to create regulations that will establish safety guidelines and provide penalties to encourage companies to follow these safety guidelines. This is a guest contribution by Jonathan Coulter, Master of Science in Computer Engineering Alumnus, Oklahoma Christian University and Colin Doyle, Ph.D., Program Director of Electrical Engineering, School of STEM, American Public University. This article represents the position of the authors and not that of ZME Science. Read more of our articles on hydraulic fracking here.